London's Metropolitan Police on Thursday said the Grenfell Tower fire death toll increased to at least 17 fatalities and is expected to rise as authorities work to find missing people. Metropolitan Police Cmdr. Stuart Cundy said 37 people were still hospitalized one day after the fire, 17 of them in critical condition. "Our absolute priority for all of us is identifying and locating those that are missing," Cundy said. "My heart goes out to those that are trying to find loved ones, please get in contact and we will support you through this. My thanks to the community for their patience. This is an exceptional and challenging time." The blaze first broke out at 12:54 a.m. Wednesday and later engulfed all floors above the second in the 24-story building that contained about 120 apartments in north Kensington. Firefighters brought the fire under control at 1:14 a.m. on Thursday. The London Fire Brigade was at the scene working to determine the cause of the fire and looking for people who are missing. The LFB said the fire was controlled after firefighters worked with gas authorities to find a ruptured gas main. About 60 firefighters, eight fire engines and other special resources were at the scene in west London on Thursday, LFB added. "The cause of the fire is not known at this stage and will be the subject of a thorough investigation," LFB said in a statement. The London Ambulance Service said it initially took 68 patients to six nearby hospitals while 10 people went to hospitals on their own. 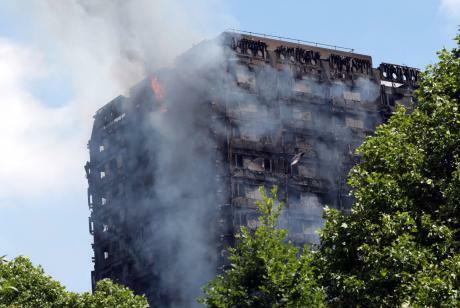 "This morning, the Metropolitan Police have confirmed that sadly 17 people are now known to have died in the terrible fire at Grenfell Tower," London Mayor Sadiq Khan said in a statement on Thursday. "I know all Londoners will continue to hold all the victims of this tragedy in our thoughts." Following the fire, the building's safety precautions have been called into question, with some saying cladding -- building material usually attached directly to the frame of a building to act as an outer wall to provide insulation and protection from the elements -- caused the fire to spread. Construction for the building was completed in 1974 and it underwent a renovation that was completed in May 2016. Cladding was added during the recent renovations.